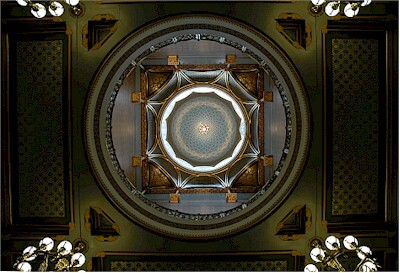 This is the bottom of the dome atop the Connecticut State Capitol. It's been a good week in the Constitution State. I've been enjoying the cold weather, after being a bit concerned that I might not be able to stand subfreezing temperatures after 20 years in San Diego. It's really not so bad, perhaps because it brings back memories of my early morning paper route or afternoon hockey on the ponds. We may get a little snow later in the week. We'll see how that goes.